This article is about slaves in general. For the slave class, see Slave (class). Slavery was once widespread throughout Tamriel, whether it was the practice of using defeated enemies as slaves or selling your own children to combat hunger, and the Dunmer have raided Black Marsh for slaves for ages. Since the advent of the Third Era, slavery was illegal throughout the Empire, but protected by law in Morrowind. This exception was granted by Tiber Septim in the Armistice of 2E 896 as a concession to the Dunmer, who saw the use of slaves as their ancient right. 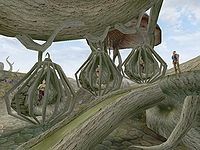 Recent developments have seen the rise of Abolitionists such as the Twin Lamps, often with support from members of the leading families on Vvardenfell. Nonetheless, slavery is still in very widepread use in the province and the topic provokes strong reactions. Adventurers might run into escaped slaves on their travels, often in remote areas, in danger from guards, beasts and bounty hunters. Many smugglers' caves contain a number of slaves usually locked behind a gate. A safe haven for those poor souls is the Argonian Mission in Ebonheart. Slaves in captivity often have magical bracers preventing their escape, and you would have to find a slave key, should you wish to free them. After freeing 21 slaves, you'll be offered a dialog about the Twin Lamps and the Code Phrase "Have you seen the Twin Lamps?" to recognize fellow members, the answer required being: "They light the way to freedom." This is a list of all slaves to be found in Morrowind. Most are Argonian or Khajiit (only Yakov in Suran and the slaves at the Slave Market in Tel Aruhn are not). In most cases, their slave key can be found in the same location, either on a table somewhere or carried by the slavers guarding them. In other cases, freeing them is part of a quest. However, in some cases, there is no key to be found. These slaves can still be freed, however. All you need to do is cast Command Humanoid on them, and get them to follow you to the nearest location for which you DO have a key. Once they are in that location, your key will work. After freeing 5 slaves, you will be told about the Twin Lamps. After you have freed 21 slaves, you will be told a secret phrase and Ilmeni Dren in Vivec will have some quests for you. After you free 30, you can speak to Jobasha (also in Vivec) to receive 3 skill books as a reward. be purchased and then freed. Dren and Arvel Plantation in the Ascadian Isles. The Dunmer Strongholds Rotheran and Hlormaren. The Slave Market in Tel Aruhn. Alms from the Argonian Mission: Visit the Argonian Mission in Ebonheart and collect donations for the Cult. Donation from Cunius Pelelius: Collect a 500 gold pledge from the owner of the Caldera Mine. Evidence of Corruption: Recover proof of Hlaalu corruption in the Caldera Mining operation. Shut the Mines Down: Shut down the Caldera Mine for Garisa Llethri.